IceStone has been around for quite a few years now. It is used as a countertop material and consists of only three ingredients: recycled glass, portland cement, and non-toxic pigments. It provides an elegant, eye-catching look for customers seeking something different. IceStone delivers gorgeous design in a range of colors, from contemporary jewel tones to classic neutrals. Custom color development is available for large commercial projects. 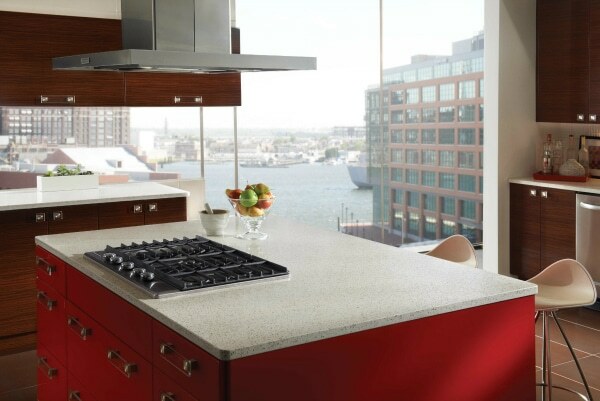 The ingredients for IceStone are sourced only the USA, and the material is manufactured in New York. Employees receive a living wage with insurance benefits and professional development plans that include skills training and mentorship programs. The glass chips that make up the “sparkle” in the stone are 100% recycled from post-consumer scrap glass. The surface is free of plasticizers or resins, and it won’t release any harmful chemicals into the air. Cradle to Cradle – Silver – The Cradle to Cradle Certified Product Standard is a multi-attribute, continuous improvement methodology that provides a path to manufacturing healthy and sustainable products for our world. NSF ANSI 51 – IceStone is certified by NSF International for NSF/ANSI 51, which indicates it is suitable for use in splash zone applications in food-related establishments.